Le Trong Kha cultivates fresh vegetables and raises clean livestock in this photo he provided for Tuoi Tre. Le Trong Kha from Vietnam is braving uncharted waters with his attempts to grow, raise, and distribute cancer-free food throughout Vietnam. Kha, 36, said his conviction is drawn from the devastation cancer as wreaked on the lives of those around him. Leaving his well-paying job to live an agrarian dream is only the first step in his pushback against the deadly disease. Access to clean food, he says, is a starting point in the fight against cancer. Many people diagnosed with the disease have little chance of survival and such little access to organic food or the inability to affirm where their food is produced and harvested is partly to blame. 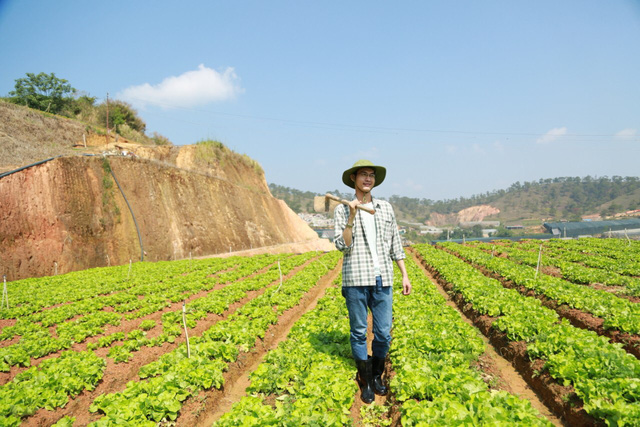 To prepare for his headlong dive into farm life, Kha returned to school to study business management and banking and finance, for which he earned bachelor’s degrees in 2009 and 2012, respectively. In 2016, he tested the waters by opening a fresh mini market. His first attempt at entering the industry, however, was less than encouraging. “After the business was on the verge of bankruptcy for a while, I decided to quit and place my focus on looking for clean, fresh food sources,” he said. Despite suffering hardship and ridicule from his family, Kha refused to abandon his dream, surviving through sheer willpower and the patronage of friends. Kha shared the story of an acquaintance that got cancer supposedly from an unplanned, untraceable diet. During a talk, the acquaintance said, “my fate was dictated by God’s will” – a statement that was stuck in Kha’s mind. Since then, he has made it a goal to spread the message that there is no fate attached to what we consume, only the consequences associated with a lack of accessibility or poor decisions. In fact, he wants to change the mindset of not just consumers, but also providers when it comes to food. To do so, he is willing to become a medium between the two. True to his words, Kha has backed down from commercial activities, instead hoping to push his movement forward by developing relationships with prominent figures, campaigning for ethical food production, and spreading new farming techniques and quarantine methods. Even so, the financial upsides are low. Kha and his company still use their own venue to conduct the quarantine process for products but success has been limited. “We still hope for better,” he commented. Aside from produce farming, Kha has also added seafood to his vision. As a man of extremes, he sets out month-long fishing trips to connect with the best the sea has to offer, despite his upcoming marriage ceremony on May 6. Even the planning for such an important life event is but a reflection of his modest yet efficient character. Instead of sending out paper invitations, Kha’s guests were notified of the wedding via email, Zalo, and Viber to save paper and time. He even set a digital calendar two weeks prior to the event as a reminder. Through his actions, he urges youth to be better minded of their money, as well as of the preservation of the natural environment.